Polo's Gilded Age legacy as a premier sport in Newport has held over, as one of the world's most unique international polo hubs, but the finer points of the game remain wrapped in an enigma to the uninitiated. For players, polo is like ice hockey on horseback. There is a definite strategy with fast plays to advance the ball toward goal, and it is also intensely physical to maneuver a thousand-pound thoroughbred downfield against defensive tactics while hitting a small plastic ball with adept stickhandling. For spectators, polo is an exciting athletic contest, a social experience with great displays of style & hospitality, and a fun afternoon outside in a relaxed park-like setting. Newport Polo welcomes thousands each year to witness the contests, join the players for Après Polo winners celebrations, and even take a swing at the sport in its training program. Read our spectator guide below for your primer on polo, make your reservations for field side fun at the Newport International Polo Series, and discover your new sporting passion in our polo training program. Attire: Attire at Newport Polo events is Newport Casual Chic. Ladies: a beautiful sundress or summer fashions, with wedges or flats, and a sun hat or fascinator. Stilettos will get stuck in the ground. Men, a collared shirt, paired with summer trousers, topsiders, and a trilby or Panama hat is always nice. Get your inspiration from our Style Album. Divot Stomp: At halftime, the announcer will invite the audience to participate in the time-honored tradition of treading-in...stomping the divots, as it has become known. While similar to baseball's 7th inning stretch, this practice also has practical purposes - to help repair the pitch in a short amount time, by replacing upturned patches of turf that the horses' hooves dug up during the first half of the match. It smooths out the field, allowing the ball to travel well, and players to keep the speed up in the second half. Even the Queen of England treads-in. It's a great time to stretch your legs (with beverage in hand if you're so inclined), toss a frisbee, and mingle. Top-tip: use the restrooms before halftime, otherwise you will have to queue. Chukker/Chukka: Both spellings are accepted. A chukker is a period of play in polo, usually 7 minutes and 30 seconds in duration. A top caliber grass polo match will have 6 chukkers, though that varies by country and event. Arena polo usually features 4 chukker matches. Mallet: The shaft is made of cane, a member of the rattan family, with a hardwood head. It’s about 4 to 5 feet long and you hit the ball with the side of the mallet, not with the end like croquet. All players must hold the mallet in the right hand; left-handed play is not allowed. The Ball: Today’s ball is solid synthetic weighing 1/4lb and is a little larger than a baseball. The ball can travel upwards of 90mph. Historically polo balls were made of willow root. Top tip: avoid a flying ball, catching the ball hurts. Field: A regulation polo field is 300 yards long by 160 yards wide (9 times the size of a football field). On the end line at each end are goal posts, 24 feet apart. Points are scored by hitting the ball between the posts. The most important rule is #18, the team with the most goals wins (yes, that is really published in the official U.S Polo Association rulebook). Direction of Play: Before the game starts, the umpires and team captains will have a coin toss to determine the goal that each team will attack first. When playing grass polo, the teams will switch directions after every goal. Confusing, though it is, the purpose is to neutralize any advantage in playing conditions such as sun, wind and field conditions. But it can cause a player to unwittingly lose track from time to time, and head towards the wrong goal with three teammates yelling behind to turn the ball around. Throw in: After every goal, the ball is put back in play with a throw-in by the umpire, when the players return to center-field, now heading in the opposite direction. At the beginning of each new chukker, the throw in takes place at the spot on the field where play ended at the previous chukker. Line of the Ball: Line of the ball is the basis for most rules in polo. The players follow an imaginary line, or right of way, created when the ball is struck by a player or it bounces off of an object on the field. Like a car on a highway, the player following the line of the ball has the right of way, and other players must yield to merge safely onto the line. Ride Off: A primary defensive move. 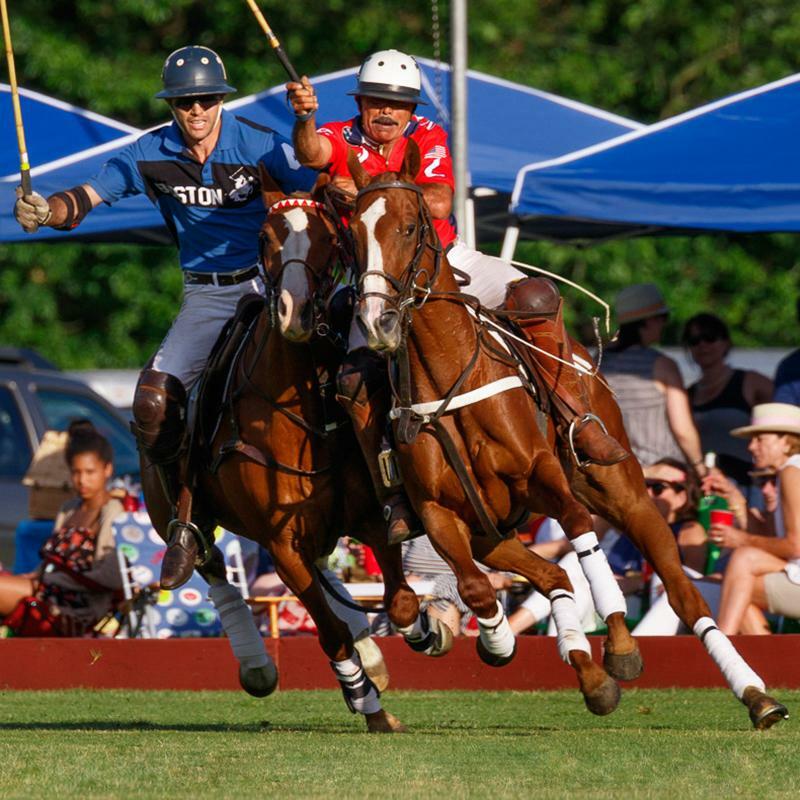 Opposing competitors and their horses make contact to push each other off the line of the ball. The ideal ride-off is done shoulder to shoulder, moving at a similar speed. Players can't come into a ride-off at a wide angle or excessive speed. Hook: A primary defensive move. A defender will use his/her mallet to hook or hit an opposing player's mallet to prevent the opposing player from hitting the ball. Defenders cannot reach across another player's horse to make a hook, and the hook must be made below the horses' back. A defender may reach across his/her own horse in order to make a hook. Players: There are 4 players per team in outdoor polo. Each team's players are numbered 1 - 4, which designates that position the player will take on the field. Unlike other sports such as soccer, football, and baseball, players do not receive their own numbers. Polo is one of the few sports where men and women play together at the highest levels. Numer One (1): Forward offensive player. In a textbook game, the number 1 would score most of the goals. In offense, this player's job is to get ahead of the pack in order to give his/her teammates a clear target to send the ball up-field. In defense, this player's job is to defend (mark or take the man) against the opposite number 4. Number Two (2): Midfield offensive player. In offense, this player's job is to provide the number 3 and 4 players a second target to send the ball forward; the number 2 will then send the ball to the number 1 and provide backup or carry the ball to goal. In defense, this player marks the opposite number three, which may be the most difficult, as the number three is typically the team captain and best player on the field. Numer Three (3): Team captain or quarterback. This player usually sets the strategy, directing his/her teammates and backing up the number 1 and 2 players in offense, but will occasionally see a play through to goal. This player is typically the best on the team. In defense, this player will usually mark the opposing number two. Number Four (4): Primary defensive player. This player will stay back, out of the thick of the play, to back up his/her teammates in offense, and be the first to turn in defense when the opposing team takes control. This player must be able to hit long distance with high accuracy. In defense, this player usually marks the opposing number one. The number four may carry the ball to goal from time to time, when teammates are too closely defended. There is no goalie in polo. Ponies: The term Polo Pony is held over from the early days of modern polo, when there was a height restriction on horses that players were allowed to use. Today, a player can use any horse they wish, though thoroughbreds are favored for their speed, agility, and endurance. It takes several years to train a horse for competitive polo, requiring almost daily exercise and drills, often with training periods lasting several months before a month or two break. Many of the horses seen at Newport Polo are former racehorses, retrained for a second career in polo. The best horses love the sport as much as the players, following and anticipating the play, and competing against their equine rivals. It is said that the horse is up to 75% of the player's handicap (rating).